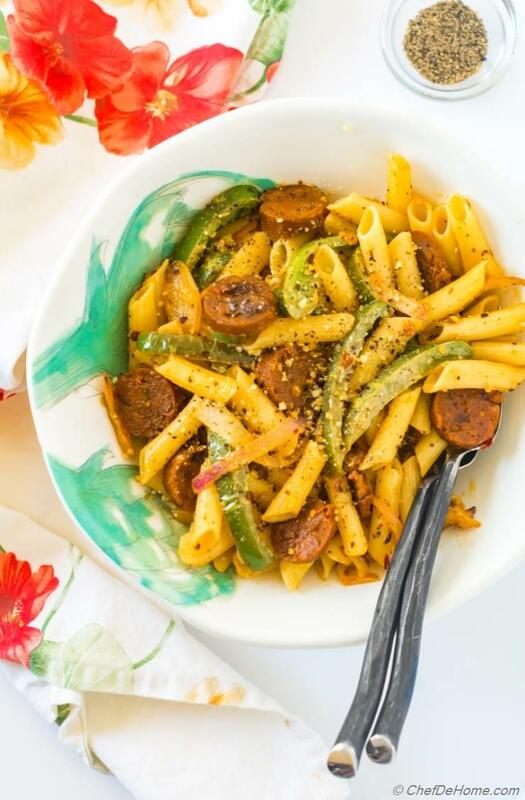 One of the easiest weeknight dinner which you can pull-off with pasta, sausage, and peppers from pantry! 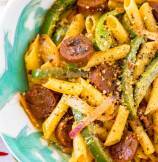 Sausage and Peppers pasta is my favorite lazy-style dinner. Whenever I want to eat homemade but not interested to work much, this 5-6 ingredients pasta makes life simple and keeps family happy! 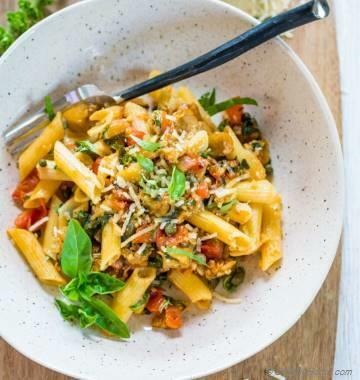 The most ingredients needed for this pasta are hidden in the name! I always keep some chicken sausage in my fridge (or freezer) for such quick pasta dinner fixes! Rest, all I need is some bell peppers, onion, seasonings, and hint of cream! In no time, this pasta bowl fly from kitchen to dinner table! We are at door steps of spring but it already feel like summer in my part of the world! Among other favorites, one thing I love about summer season is opportunity to be outdoors. Summers is also season of country fairs and I enjoy roaming aimless in fair. I really do! Even for a day, it is refreshing to see excited people and specially experience fair food. As far as I remember, fair is THE place where I first had delicious combination peppers and onions. Mostly in fairs, they have big pile of onions and pepper cooking on one side of a flat grill and sausage on other. The aroma of cooking bell peppers and onions has always allured me to order. 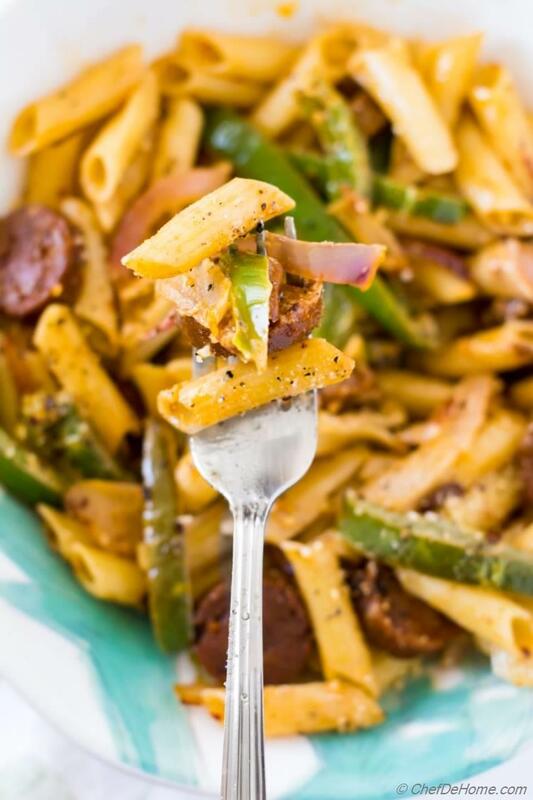 For many days after fair, we would bring Italian chicken sausage, saute onions-peppers on flat griddle and devour it many ways - topped on dinner rolls, grilled on pizza, or mixed with some penne pasta! pure yumm!! Specially, when I crave sausage and peppers in winters.. there is less chance of grilling outdoor! But, fortunately I still keep some chicken sausage in my fridge (or freezer). Once I have sausage, sausage and pasta stars starts twinkling in my eyes! 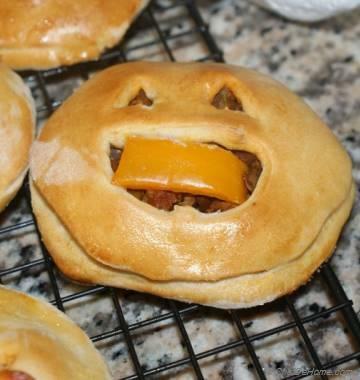 sausage pepper, twinkle twinkle! LOL! Like I mentioned, this pasta dish, by nature, is a delicious lazy-girl's dinner fix! To make sausage pepper pasta, I first set pasta to boil. For that, I bring pot of water to rolling boil, then season with salt, drop in pasta and let it cook as per package directions. While pasts cooks, I heat oil in a wide saute pan, then slice and saute the sausage until it is crisp. Cooking sausage also flavor the oil it is cooking in.. which comes gives another layer of flavor to pasta. I remove the cooked sausage from pan, and the cook onions and peppers in same oil with 1 tbsp of chipotle. If you don't have chipotle en adobo (which I use a lot), you can also use chipotle powder. I use chicken chorizo for this recipe which paired well with little bit of chipotle. When using Italian sausage, I like use chili flakes and some oregano instead. I have added complete flavor-combination chart at the end of post. By the time, sausage, peppers and onions are ready... pasta is ready too. I saute the pasta with onion and peppers with little to make it more flavorful. Also, I add a little bit of cream to balance the spicy flavors. That's it! 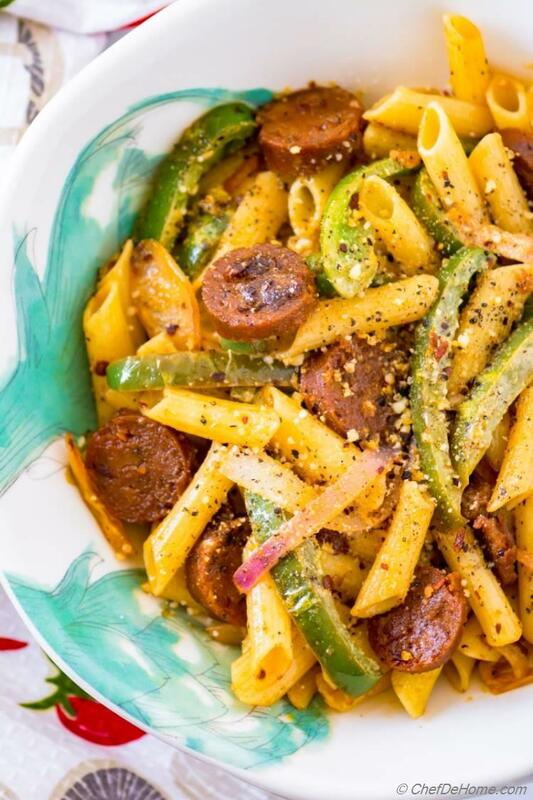 Peppers and sausage pasta is ready to devour! 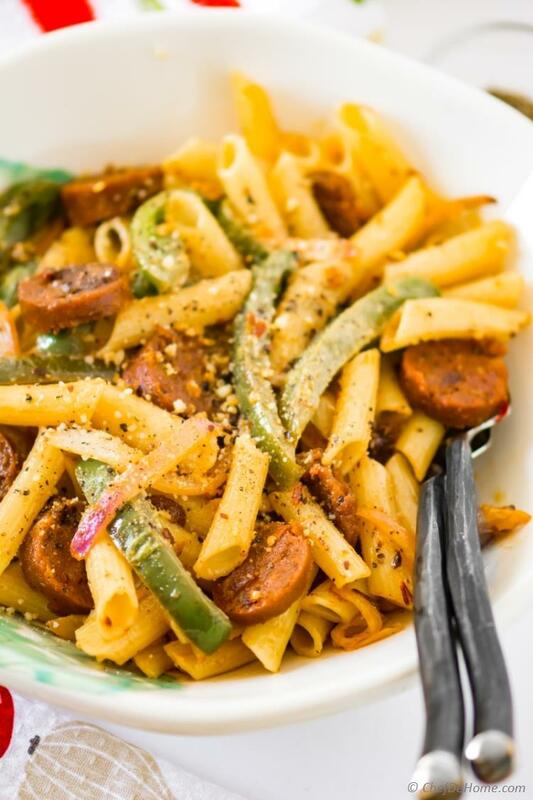 Sausage, Peppers and Pasta - Few ingredients, many combinations! You will be surprised to hear that flavor of this pasta depends a lot of kind of sausage used. Hence, sausage, peppers and pasta can have N number of flavor combinations. Few of my favorite depend on variety of sausage we like to eat. Note: We only eat chicken or lamb sausage, so all of the above combinations are based on my family's liking and available flavors. 1. Cook pasta according to package directions. While pasta cooks, heat oil in a heavy bottom saute pan. Add sliced sausage and cook until brown at edges or done to your liking. Remove in a plate and set aside. 2. In same pan, add minced garlic, onion and pepper with chipotle and 2 generous pinch of salt. Saute until onions are soft. 3. Add cream, lemon juice and mix well. Add cooked pasta and stir to coat in sauce. Return sausage back in pan, cook until just heated through, about 1 min. Taste and adjust salt. 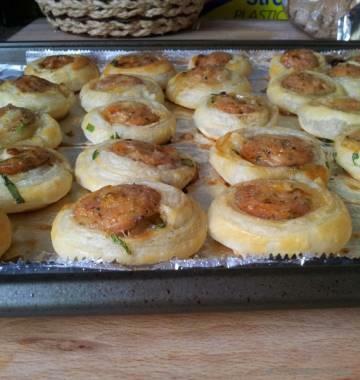 Garnish with parsley and parmesan cheese (optional). Serve and enjoy!